Attorney General Jeff Sessions told reporters that he does not approve of cannabis and suggested it leads to more violence, while politicians in states where cannabis is legal said they will resist any federal crackdown. At the Department of Justice on Monday, Attorney General Jeff Sessions told reporters he believes cannabis use is unhealthy and leads to more violence, according to Politico. “I don’t think America is going to be a better place when people of all ages, and particularly young people, are smoking pot,” Sessions told reporters. “I believe it’s an unhealthy practice and current levels of THC in marijuana are very high compared to what they were a few years ago.” Those comments come a week after press secretary Sean Spicer suggested that the opioid crisis is tied to recreational cannabis use and seemed to hint that President Trump is okay with legal medical cannabis, but that the administration might not approve of recreational cannabis. During a press conference last week, White House press secretary Sean Spicer told reporters “I do believe you will see greater enforcement of it,” referring to the enforcement of the Controlled Substances Act on recreational cannabis. He went on to make the distinction between medical and recreational use clear, while deferring to the Department of Justice, saying they will be looking further into the matter. Much like press secretary Spicer incorrectly tied legal cannabis to the opioid crisis, Attorney General Sessions incorrectly tied legal cannabis to an increase in violence. “We’re seeing real violence around that,” says Sessions. “Experts are telling me there’s more violence around marijuana than one would think and there’s big money involved.” He did not discuss who those experts were or how he came to that conclusion. There are a number of studies refuting his claims, suggesting no causal link between legal cannabis and violence, with one study even suggesting a reduction in violent crimes after legalizing cannabis. Sessions has not mentioned any specific policy actions that he would take on the enforcement of federal law. “We’re going to look at it. 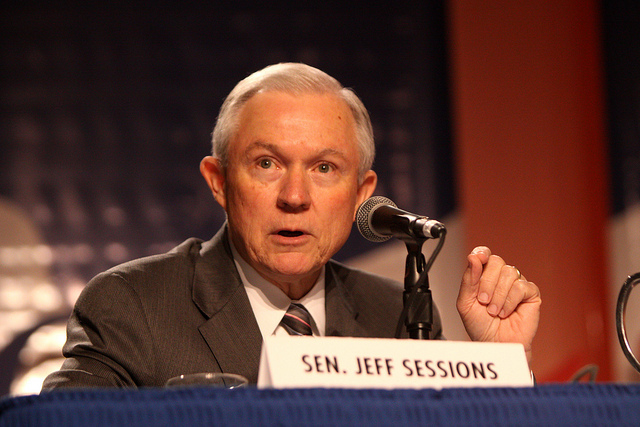 … And try to adopt responsible policies,” says Sessions. Jeff Sessions making these comments should come as no surprise as he expressed his disdain for cannabis a number of times and has been known to be a Drug War stalwart. President Trump promised during his campaign that he supports medical cannabis and the matter should be left up to the states. These recent comments by his newly appointed press secretary and attorney general suggest the administration may not honor that campaign promise. At this time, it remains unclear exactly how the Trump administration will address federal cannabis policy, but these vague and ominous statements from top federal officials continue to raise eyebrows in the cannabis industry. Until President Trump comes out with a clear stance on legal cannabis, those in the cannabis industry fear a federal crackdown on legal recreational cannabis is looming.